3-D Gel Flesh. 3-D Gel is used to create realistic three dimensional special effect additions to a character’s makeup. 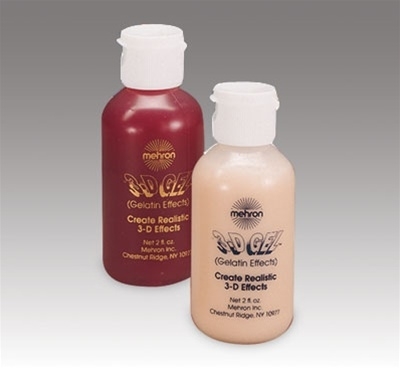 Mehron has developed this 3-D Gel to create Realistic 3-D Effects in blood red. You can create most ghoulish effects with 3-D Gel. To use the 3-D Gelatin Effects just heat it to a liquid form, brush on, allow curing, and carve it up to your delight. There is no adhesive needed when using the 3-D Gelatin Effects. 3-D Gelatin Effects removes from skin and hair with warm water. 3-D Gel, Gelatin Effects may be used as a substitute for latex on children.